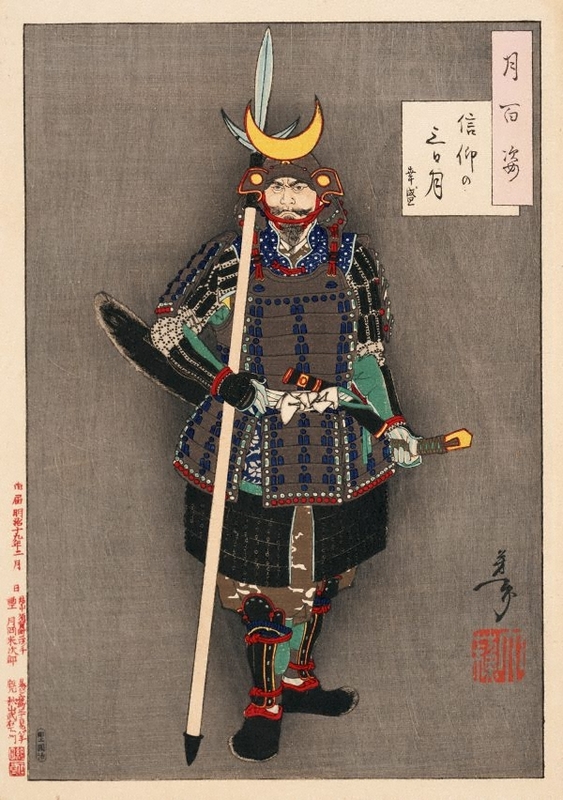 The samurai warrior depicted here is Yamanaka Shikanosuke Yukimori, one of the ten heroes of the Amako clan, who served the Lord of Izumo province (today Shimane prefecture) during the 16th-century civil wars. He is shown here in full armour, holding a kamayari or ‘sickle-spear’. The crescent shape of the crosspiece of the halberd echoes the moon sickle on his helmet. In Japan the ‘moon of the third day’ ('mikazuki') is believed to be a lucky emblem. Yukimori, who was very superstitious, has chosen this motif for his war helmet, hoping for protection and good luck in battles.